Did you know that the first concept of gutters was invented around 3.000 B.C.? Yes, water problems are not new in the 21st century, but whether you call them gutters or gargoyles they have a very important job to do. Gutters must drain water from one location (or the highest point) to an area that won’t damage or ruin important areas on your structure or home. When is it time to consider new gutters? Do your gutters leak between the seams? Are they misaligned and causing water to be misdirected? Is the attachment system that holds your gutters coming loose? Do they look grimy or dirty no matter how well you clean them? Did ice or snow damage your gutters? If you answered yes to any of the questions above, then you’re probably in the market for new gutters. Why Are Seamless Gutters a Permanent Solution? If you’re looking for a solution to protect your home for many years to come, we recommend adding seamless gutters. Our seamless gutters are custom tailored to your home to prevent unsightly seams in the middle of a section. This means fewer potential areas of weakness, and fewer problems with your home in the future. The always-popular half round and K style gutter systems are available in both 5-inch, and 6-inch sizes. Let our experienced gutter consultants help you select the best looking, and functioning gutter system for your home. 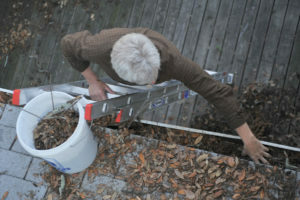 Can You Afford to Not Replace Your Gutters? America’s most hated chore can be a thing of the past with America’s most trusted brand — Gutter Helmet. Eliminate gutter maintenance forever and protect your home from expensive water damages. With Gutter Helmet, you not only get the best performing and strongest guard system on the market, you also get the best protection with our triple lifetime manufacturer performance warranty, that is transferable! With Gutter Helmet, you not only get the best performing and strongest guard system on the market, you also get the best protection with our triple lifetime manufacturer performance warranty, that is transferable. We’re unique from the standpoint that the manufacturer backs the performance not the dealer who installed it. You, and any new owners are 100% covered for the life of the product on your home.